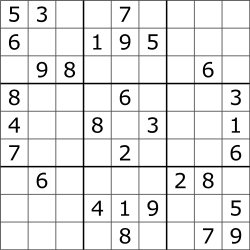 Sudoku (数独, sūdoku, digit-single) (oreeginally cried Nummer Place) is a logic-based, combinatorial nummer-placement puzzle. The objective is tae fill a 9×9 grid wi deegits sae that each column, ilk raw, an each o the nine 3×3 subgrids that compone the grid (an aa cried "boxes", "blocks", or "regions") conteens aw o the deegits frae 1 tae 9. ↑ Schaschek, Sarah (March 22, 2006). "Sudoku champ's surprise victory". The Prague Post. Archived frae the oreeginal on August 13, 2006. Retrieved February 18, 2009. This page wis last eeditit on 11 Mey 2017, at 05:16.